A controlled naturalism characterizes the new sculptures (all 2010) by artist Ben Lock. 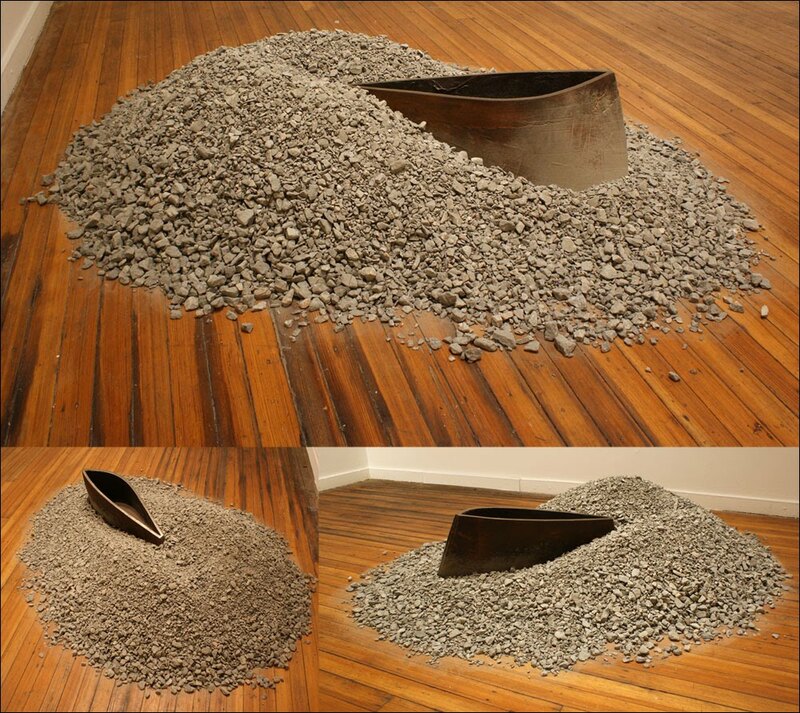 They are an achievement and a departure in relation to the vessel-like forms he has built over the last few years. Finely worked edges, surfaces and structural compositions indicate his growing procedural strength. Careful arrangements of detached materials arouse new visual frictions. Lock unites separate entities, setting up comparisons that explore divergent notions, such as harmony and discord or strength and weakness. His pieces, recently on display in “Are You of The Body?” at School 33 Art Center in Baltimore, Maryland, are part of curator Gerald Ross’s well-balanced scheme. A nice flow of vibrant paintings by artists Mason Eubanks and Kathleen Thum effectively offsets the earthy stoicism of Lock’s floor-bound creations. 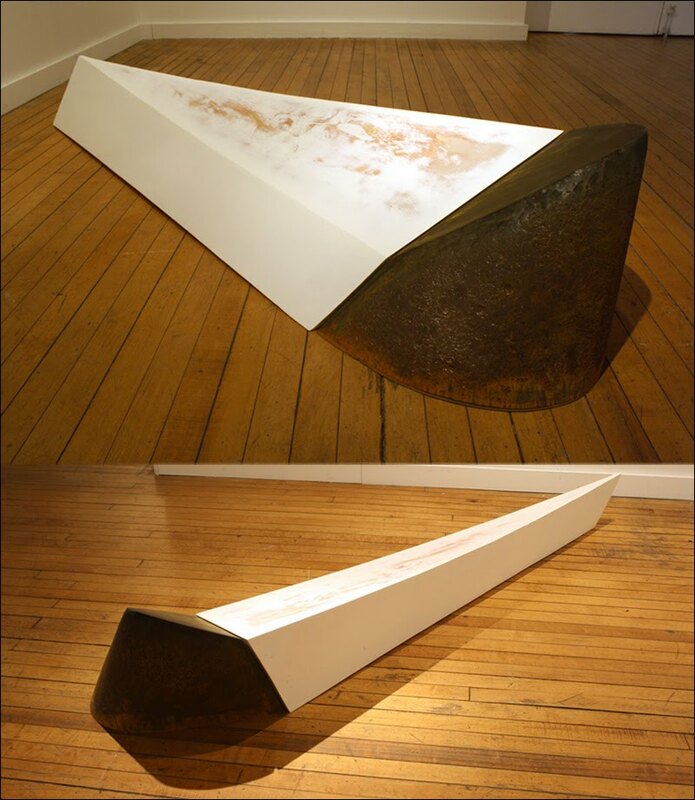 Ships In II, the show’s largest and most commanding piece, combines a long, angular wooden shape with a smaller, taller, rounded steel construction. Strategically considered lines lead the eye to a dark, inch-wide crevice that serves as a jumping point for several comparisons between the two imposing forms. The wooden structure’s smooth, white planes and seamless edges result from the layering of polyester resin and paint. A worn quality is apparent as patches of wood grain peek out through heavily sanded areas. 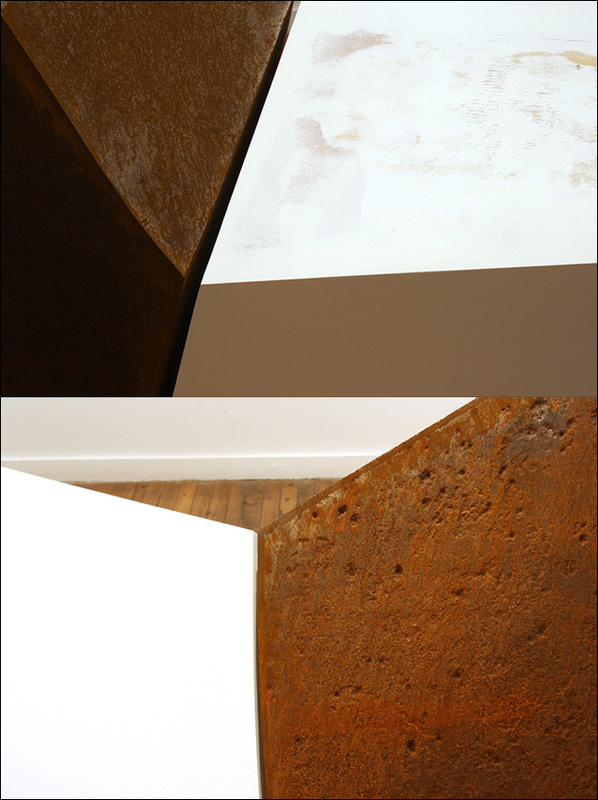 The pocked, rusty steel surface resembles the moon during a lunar eclipse and abruptly counters the sleek wooden slopes. Similar to his use of surface agents on wood, Lock grinds, rusts and applies chemical patinas in search of these finished metal exteriors. The contrasting surface qualities, both in terms of the variations on one material and when the two are compared, add much to consider when viewed at close range. For instance, in Ships In I, a smaller variation on the theme, the mix of wood grain and polyester resin visible through the sanded paint on the uppermost plane appears vulnerable and aged, as compared to the smooth, uniformly painted, wooden planes sloping to the floor on either side. One might imagine a beach cottage with weathered boards and another one with new siding. An interesting analogous relationship exists between the bright, orange rust along the steel’s bottom edge and the warm wood tones exposed on the top plane. Subtle complexities emanate from the arrangement of contradictory angles, varied edges and uneven sides that compose the two forms. Effectively anchoring the work in the gallery’s larger room, At Bay holds court between Ships In I & II. 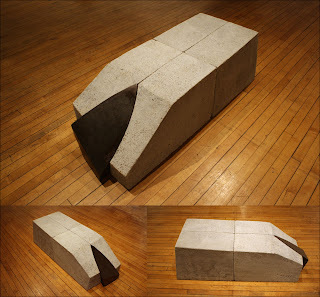 Its slanted, rectangular form consists of four cement blocks and a cast iron wedge that fit together so precisely as to appear fused and sliced. The dark brown iron and light gray concrete create a similar, though less intense, value contrast as do the wood and steel. Stones creep through the bumpy cement’s porous exterior, in sharp contrast to the smooth, slick iron face. Like an arrowhead stuck in a bison bone, the metal thorn slivers into the four molded blocks. Or is it being pushed out by the larger form’s force? In this still embrace, Lock creates anticipation. Are the materials joining or coming apart? Like a relic emerging from an ancient civilization’s excavation site, Run Aground reveals a dualism between durability and decay. An ashy pile of crumbling gravel surrounds an imposing, pinched, container-like cast iron form. Unlike the closed sculptures in the larger room, this open structure reveals its interior. Holes and voids recur in Lock’s work, adding vulnerability and possibility to his otherwise potent sculptures. The materials engage more personally than in the other pieces, as dusty residue literally dirties the metal wall. 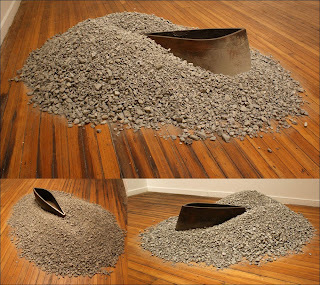 Their juxtaposition creates motion that can be interpreted in at least two ways: Is the iron digging into the gravel like a tooth on a front-end loader, or is it thrusting forward like a speedboat’s bow skimming through a gravel sea? A similar chord runs through Lock’s new works, while each piece speaks for itself. This well-considered mix of geometric and organic concerns yields an attractive disparity. Two objects become one and a greater potential is clear. Recently, Ben agreed to answer a few questions about his work, process and thoughts. The interview continues below. CONTEMPORARY ART REVIEW Which forms and surfaces from your surroundings influence the forms and surfaces that you make? What do they mean to you and why do you reference them? BEN LOCK These particular sculptures are heavily influenced by thoughts of the sea and nautical forms. Concepts originating from notions of journey, relationship, and quest as well as struggle are contained within the work. I hope the work possesses a variety of potential and can articulate greater meaning through metaphor. The material and the relationships of the forms influence each other. The surfaces are evidence of my creative process in combination with the natural qualities of the materials. It is significant that the surfaces relate to the forms effortlessly. CAR Can you elaborate on the significance of this effortless relationship between the surfaces and forms? BL The forms have specific relationships, and the surfaces play a large role in that. I spend a lot of time working the surface to build layers, connections and disconnections, all furthering the dependence of the forms on one another. Subtleties can require many hours, attempts, and decisions to get right. The work needs to have an apparent sense about it, or it will fail. CAR Can you describe your thought process concerning the interaction of different materials? BL Materials are loaded, contextually and physically possessing presence. By contrasting or complementing forms made with different materials, I harden or soften a piece and add to its presence and relevance. These sculptures rely on their counterpart to be complete and to finalize the statement intended to make. CAR As you work with wood and metal do you encounter moments where your experience with one material influences the way you approach the other? More specifically, have you developed any experimental processes as a result of making this kind of work? BL Whether working with steel or wood, the planar forms and edges receive similar attention with different process. I first started working with polyester resin in automobile applications on metal and then found it to be a versatile material for wood as well. I enjoy the color and layering effects. Both steel and wood have characteristics that I respond to and relate with; I shift gears when changing materials. CAR What's next? Are you pondering any new approaches or directions for future work? BL Currently, I have been drawing and generating ideas for new sculptures which could be the beginning of a new body of work. Continuing with steel and cast metals, a direction involving the use of automobile paint may evolve. To learn more about his artwork and progression, please visit www.benlockart.com. Thank you for reading, and thank you, Ben, for your participation.